Assessment programs provide the means to measure effectiveness of programs and progress towards strategic goals. Large-scale assessment tools, i.e., LibQual+, ITHAKA, and NSSE, inform library decision- making and planning. The use of small-scale assessment instruments enable the library to be more agile and responsive to user needs. Brown University’s project focused on developing an understanding of research skills of first year students. First Year Seminar faculty were interviewed about expectations and perceptions of student research skills. This research revealed opportunities for the Library to rethink its instruction program and collaborate with campus partners to develop programs and connect students to the support they need. Evelyn (Bordac), S., Quist, E., O’Mahony, D., Takayama, K. and Gaylin, A. (2014). 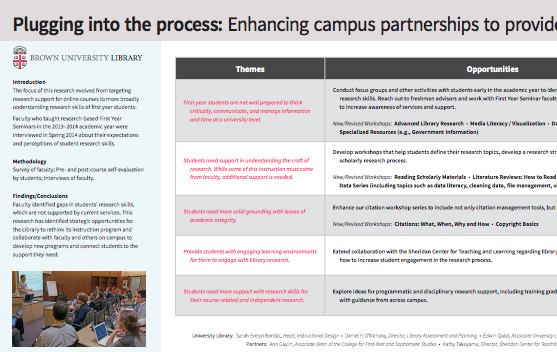 Plugging into the process: Enhancing campus partnerships to provide robust student research support. Assessment in Action, ALA Annual Conference, Las Vegas, NV.